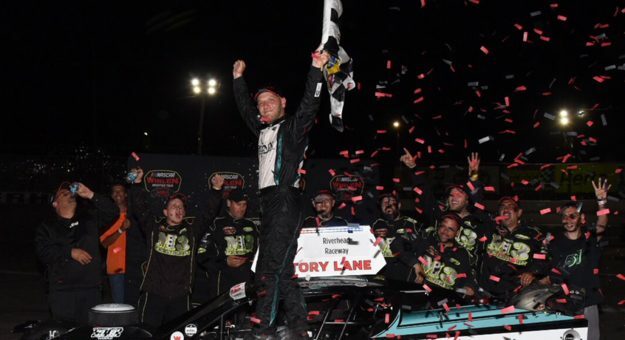 RIVERHEAD, N.Y. – Justin Bonsignore held off Ryan Preece through a furious finish to capture the Buzz Chew Auto Group 200 checkered flag Saturday night at Riverhead Raceway. A native of Holtsville, New York, Bonsignore took the lead for good on Lap 171 and drove to his fifth career victory at the Long Island quarter-mile. It marked the 16th career Whelen Modified Tour victory for Bonsignore, who has won four of seven in 2018 as the season nears the halfway point. He now has a 33-point lead atop the standings. Bonsignore won his seventh career pole earlier in the afternoon, but Timmy Solomito gained the lead from the drop of the green. Preece moved to the front on Lap 19, and it was a two-horse race with Bonsignore from there. Preece had a commanding lead when a caution came out on Lap 100. On the ensuing restart, Preece appeared to get loose, allowing Bonsignore to move to the front. There would be one more lead swap with 60 to go before Bonsignore’s decisive pass. Preece settled for second while Doug Coby came home third as only the podium drivers finished on the lead lap. Dave Sapienza and Solomito brought home the top five. Craig Lutz rallied from a mid-race incident to finish sixth, followed by Chase Dowling, Tom Rogers Jr., Kyle Soper and Ronnie Williams. The Whelen Modified Tour will return to points-paying action on Saturday, July 21 at New Hampshire Motor Speedway. The All-Star Shootout will be contested the day before at the “Magic Mile” in Loudon, New Hampshire. Next up, Loudon. The super speedway will sort them out. GREAT JOB JUSTIN. Always liked him. He’s talented, and a very clean driver, you rarely see him roughing up other cars. Seems to have that LFR car figured out. Hope he holds on and wins this year’s championship. This is interesting. The qualifying lap times for the first, 10th and 20th qualifiers in the NWMT race at Seekonk on 6/2 were 11.93, 12.12 and 12.25. The qualifying speeds for the same three positions at the NWMT race at Riverhead were 11.93, 12.08 and 12.25. Third mile vs quarter. Man that third mile donut at Seekonk is fast. At Waterford the VMRS lap times are 14 seconds plus a lot. 19 cars on the lead lap at Seekonk. To get to 19 cars at Riverhead you have to go to cars 4 laps down. That’s a lot of laps. 7 cautions at Seekonk to 3 at Riverhead so that’s big factor. But also are those tight Riverhead turns where handling and HP exiting for the best of the best is magnified. Versus Seekonk where there is no real straightaway and it’s pretty much a constant big sweeping arc. Seekonk vs Riverhead. Interesting.You’d think only 3 cars on the lead lap would be boring but when they are who they are and the racing is tight it’s the opposite of that.